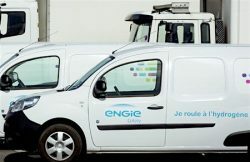 Located in the heart of the International Market of Rungis, ENGIE’s new hydrogen fuel station will power a fleet of 50 Renault Kangoo Z.E. utility vehicles, recently made available for long-term rental through Alphabet, a leader in mobility solutions for companies in France. These vehicles will be used by ENGIE Cofely technicians to ensure multi-technical operations and maintenance work for commercial buildings in the Ile-de-France. Equipped with extended hydrogen autonomy systems by Symbio, the leading European outfitter for hydrogen mobility solutions, these electric vehicles neither produce particles nor gas emissions and are further enhanced with a reduced recharge time and greater autonomy. This station has a provisional refueling capacity of 20 kg/day in hydrogen but should increase rapidly to 80 kg/day. This scale corresponds to the immediate needs of current vehicles in the south of Paris. The definitive installation will produce renewable hydrogen on site with an electrolyser powered solely by renewable energy. The hydrogen station is designed, manufactured and integrated by McPhy, a leader in production, storage and hydrogen distribution equipment that serves the energy transition. The whole project has been given financial support from the European Fuel Cells and Hydrogen Joint Undertaking (FCH JU). With a stream of more than 25 000 vehicles per day, the Rungis Market, which offers free motorway toll to all clean vehicles that use the station for refueling, is a strategic location for the development of green mobility for freight transport in Ile-de-France. As the quality of air is a major public health issue, accelerating the development of green mobility is even more important given that the transport sector is responsible for 35% of the carbon emissions in France. ENGIE positions itself as a forerunner in this revolution. The Group develops solutions that cover the full range of green mobility technologies, adapting to all uses of the personal vehicle freight transport. ENGIE owns, through its subsidiary GNVert, more than 150 alternative fuel stations in France. ENGIE is also an international leader on the recharging infrastructures market for electric vehicles, with a presence in 30 countries and 980 cities around the world. Mobility is not the only area of application for renewable hydrogen, notably in the area of large-scale energy storage. For ENGIE, renewable hydrogen is one of the missing links needed to construct a more sustainable energy system. This conviction led the Group to create in the beginning of 2018 a business unit with a global vocation dedicated to this market in the making.